Demand for life insurance as a low-risk wealth management tool has risen, a recent survey has found. Even Asia's wealthy or high net worth (HNW) families are feeling relative strain in these times of economic volatility and shifting their focus from asset growth to wealth preservation, the survey concluded. This creates a greater emphasis on legacy planning in order to transition wealth to the next generation. The survey by Transamerica Life Bermuda was conducted in partnership with Asian Private Banker. A total of 455 private banking and wealth management practitioners representing 29 private banks, institutions with private banking facilities and wealth management firms in Hong Kong and Singapore were surveyed between June and September this year. The majority of survey participants agreed that life insurance policy purchases rise with market uncertainty. "Asia experienced an economic boom from the 1970s to 1990s and as a result the region is in a period of transitioning wealth from the first generation to the second generation," said Mr Marc Russell Lieberman, president and chief executive of Transamerica Life Bermuda. "In unpredictable market conditions, Asia's ultra high net worth individuals are increasingly looking to establish wealth legacy plans to ensure business continuity and peace of mind as they expect to pass on upwards of US$1 trillion (S$1.4 trillion) to the younger generation." In unpredictable market conditions, Asia's ultra high net worth individuals are increasingly looking to establish wealth legacy plans to ensure business continuity and peace of mind as they expect to pass on upwards of US$1 trillion to the younger generation.
'' MR MARC RUSSELL LIEBERMAN, president and chief executive of Transamerica Life Bermuda. Almost two of three wealth managers surveyed said childbirth or succession planning is the key trigger most likely to lead to a conversation about life insurance. This is followed closely by family death or serious medical issues, and significant changes in business ownership. Among the three most important criteria that clients look out for when selecting a life insurance provider, product pricing emerged tops (73 per cent), followed closely by financial strength (67 per cent) and brand reputation or heritage (56 per cent). Two out of these three factors are trust-based, suggesting that trust is a critical factor in the consumer's decision-making in wealth and legacy planning. The survey also revealed that the most significant factors stimulating growth of life insurance across private banks include the need for client estate, legacy planning and health coverage (36 per cent) and increased relationship manager education (30 per cent). On the other hand, the most significant factors that inhibit growth of life insurance across private banks include unsuitable product terms and pricing (37 per cent), and the lack of client or relationship manager understanding (28 per cent). As HNW affluence continues to grow in Asia, financial tools such as universal life policies remain relevant across all age profiles of HNW people as part of wealth and legacy planning. A universal life insurance is a "jumbo-size" life insurance policy that provides a guaranteed death benefit payable upon the demise of the life insured. The survey indicated that younger HNW people (40 per cent) between 31 and 50 years old are more inclined to purchase a universal life policy, compared to those aged 51 and above (33 per cent). 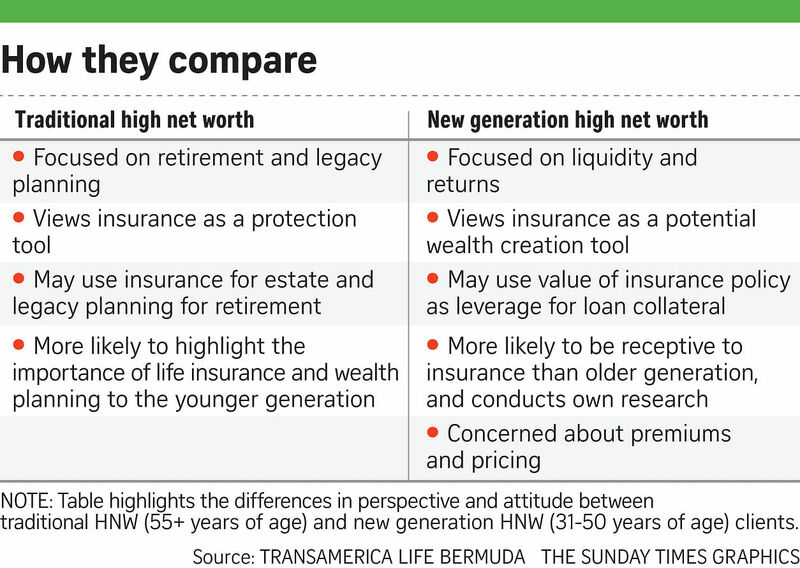 However, the approach to financial tools such as universal life policies is changing, with younger HNW people shifting perceptions from insurance as a mere protection mechanism to a potential wealth creation and financial planning tool. Of wealth managers polled, the majority (32 per cent) indicated that universal life is the best option compared to other insurance products including retirement, annuity, hospitalisation and medical, index-linked, and so on. In contrast, the majority of respondents indicate that only 5 per cent to 10 per cent of private banking clients have purchased a universal life policy. This suggests that there is considerable room for the HNW life insurance market to grow in the region. Over the next two years, 56 per cent of private bankers foresee that universal life policies will show the fastest increase in popularity among their clients compared with other life insurance products.